Today we continue our series of posts, describing the preparations for our Argentinean tango inspired 3D gathering, which will be held around Valentine’s Day for ten lovely couples. Learn more in posts I, II, III, and IV. Since Valentine’s Day and sweets go hand in hand, we wanted to pay special attention to our dessert plate and finish the evening off right. Providing the nature of the holiday, it seemed logical to explore the possibilities of using roses and their essential oil in our dessert. That turned out to be a very interesting and therapeutic experience, and we could hardly wait to share these treats with you. One of our sponsors, Wholistic Inc., work exclusively with food grade ingredients in their wonderful skin care line. The essential oils they utilize are the purest out there. Wholistic gave us a generous donation of steam distilled rose oil and dried edible roses, which we used to make the most amazing rose ice cream. Essential oils work by “waking up” certain receptors in the brain, and thus having a healing effect on the body, both emotionally and physically. Rose oil is capable of treating anxiety and is a wonderful mood elevator. When those benefits combine with the amazing taste and aroma, the whole experience becomes incredibly dimensional. 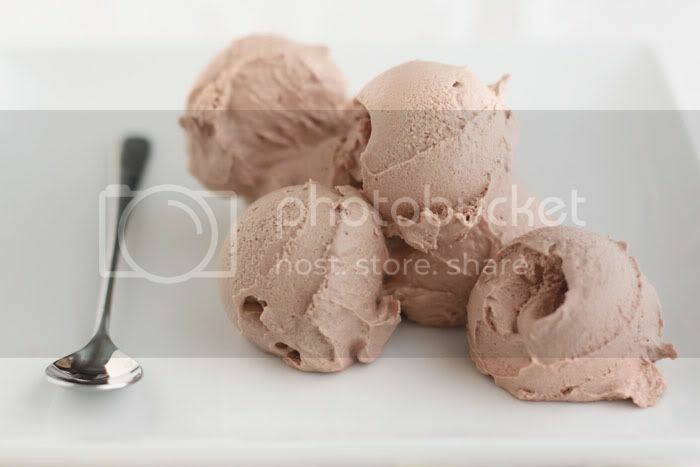 It is impossible to put the taste of that ice cream into words. 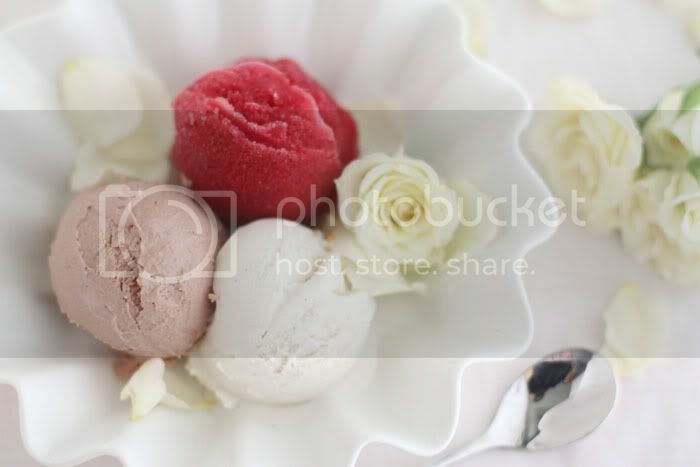 It seems as if all the senses are engaged when taking a bite – every spoonful of that ice cream transports me onto a different planet. I used one tiny drop of the essential oil in a batch of rose ice cream, but the house smelled like an entire rose garden while the ice cream machine was on. 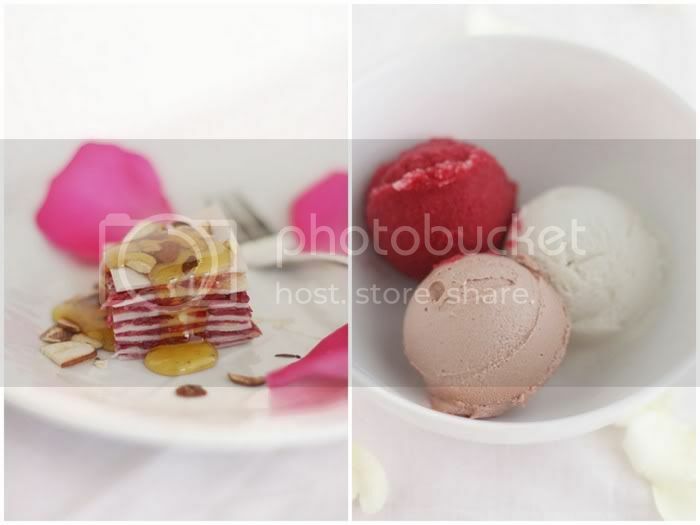 The rose ice cream will be served with a fresh, perfectly tart pomegranate sorbet and a scoop of vanilla ice cream. 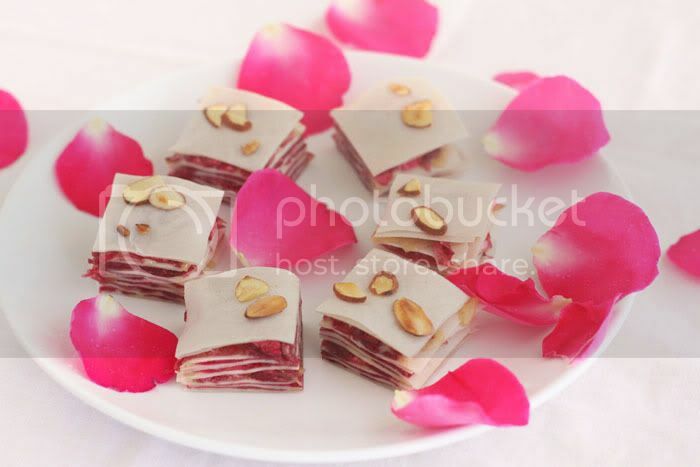 We will also be serving mille-feuille, for which we used fresh organic rose petals. They are gently crushed in a mortar and soaked in raw honey. 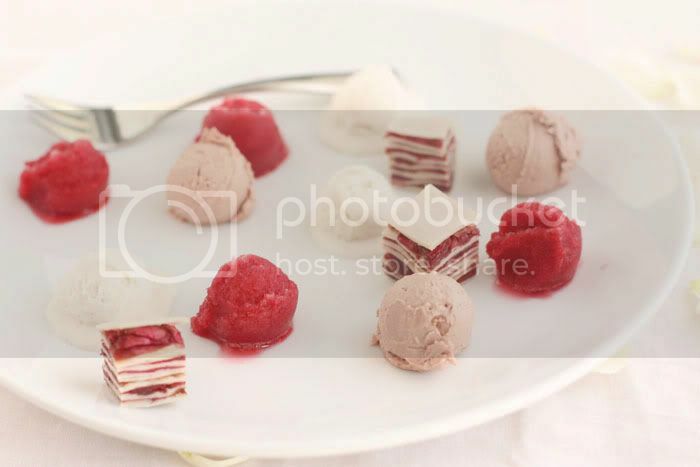 Combined with a vanilla bean cream and layered between thin coconut sheets, they make for a unique dessert. Happy Valentine’s Day to you! Stay tuned, we will let you know how the event went in our next post. Combine all the ingredients in a high speed blender until smooth. Let it chill completely and process in an ice-cream machine according to the manufacturer’s instructions. Freeze for at least 2 hours before serving. Combine all but the last ingredient in a high speed blender until smooth. Let it chill completely and process in an ice-cream machine according to the manufacturer’s instructions. Add the rose oil towards the end. Freeze for at least 2 hours before serving. Combine all the ingredients in a high-speed blender. Let it chill completely and process in an ice-cream machine according to the manufacturer’s instructions. Freeze for at least 2 hours before serving. If served a dessert plate like ours, with all the components, you can optionally give it a drizzle of chocolate sauce. That what I decided to do at the event. It is Valentine’s Day, after all. In a high-speed blender, blend the coconut meat and water until completely smooth, adding more coconut water if needed. The amount of coconut water and resulting coconut pasta can vary depending on the coconut meat quality. Thicker meat, from more mature coconuts, will require more water, and therefore will yield more crust. Spread the mixture onto two Teflex-covered dehydrator trays and dehydrate at 115F for 2-4 hours, until pasta is dry enough and ready to be separated from the Teflex sheets. Flip over and carefully peel away the Teflex. Dehydrate for another 30 minutes or so, to make them completely dry. Take care, as they will be very thin and delicate, don’t over dry them before cutting. Cut each coconut sheet into 4 even squares, then cut each square in half lengthwise. You should end up with sixteen even coconut pieces. You can start layering the mille-feuille immediately or store the coconut sheets in the refrigerator, separated by parchment paper. Generously drizzle honey over rose petals. Let soak for 1-2 hours. Combine all of the ingredients in a high speed blender until very smooth, adding coconut oil at the end with the motor still running. Start with laying down the coconut sheets one on top of another, two pieces at a time. Top each layer with vanilla cream using a squeeze bottle, pipping bag, or a spoon. Continue with honey soaked rose petals, followed by another set of coconut sheets. Alternate your layers until all coconut sheets are used up. Finish with a coconut pasta layer. Optionally, garnish with more cream, toasted almonds, and rose-infused honey. Let it sit in refrigerator for several hours or overnight before slicing. I cut a large rectangle in half, then cut each square into four small squares. Make it any shape you like. The Mille Feuille holds very well in the refrigerator for a couple of days. Although it is very good if served right away, it becomes even better after some time in the fridge, when the flavours are fully integrated. That mille-feuille is amazing. So intricate and beautiful. You are so talented. This is really amazing and beautiful. oh my goodness, this is gorgeous!!! Wow, talk about edible flowers. You give that a completely new meaning. This really sounds unique and looks beautiful in the making. Where do you get all of these ideas and what inspires such creativity? You guys have the best food blog out there. Raw or not. I love your photos! always look amazing! Wow! What else is there to say? Just stunning ideas and pictures. Oh, I do I do I do want to make this! Fantastic. knocked it out of the park! This is so, so breathtaking! I love pomegranate. Oh my God. This is just the most amazing, gorgeous, mouthwatering dessert I have ever seen. It sounds like a pure experiment. Indeed words are hardly enough to describe it… A wonderful challenge for me! Looking forward to it! Gorgeous and looks so delicious too! Wow, your pictures are great! Thanks for sharing, this looks delicious!